Have you ever had an 'awesome' experience? Many of you will say 'yes'. Some may say 'lots of times'. As an adjective, the word 'awesome' has become debased. It is now often used for anything someone likes, enjoys or admires. I dislike this modern usage. I think that truly 'awesome' experiences are rare. I understand a truly 'awesome' experience to be one which leaves people awestruck, brought to their knees in silent wonder or paralysing fear, or prostrate on the ground, completely overwhelmed. 'Awesome' occasions may be deeply emotional. Think of an athlete completing a spectacular victory, or collapsing on the ground at the finish of a long gruelling race and hearing the roar of the crowd. 'Awesome' events may be moments of spiritual illumination. This can happen as we gaze at a beautiful landscape or painting, watch an amazing sunrise, or listen to great music that stirs the soul. 'Awesome' moments may be absolutely dreadful. Just think of that great mushroom cloud over the Japanese city of Hiroshima on 6 August 1945. An 'awesome' moment is one which cannot be forgotten. "the appearance of his face changed, and his clothes became dazzling white". They were given a glimpse of the glory of God in the face of Jesus Christ. They had probably often accompanied Jesus when he was praying, but this time was unforgettable. They saw Jesus in a new overwhelming light - a truly 'awesome' experience. That 'awesome' event is celebrated on 6 August, the Feast of the Transfiguration. "kept silent and in those days told no one any of the things they had seen". Was that because they were awestruck and could find no words to describe their experience? Was it because that epiphany was so deeply personal, touching each of them at the core of their being? Was it because when they came down from the mountain with Jesus they were immediately plunged into some desperately difficult situations? What happened at the Transfiguration of our Lord? You can't explain the transfiguration, any more than you can explain Jesus' resurrection. To glimpse something of what it means needs music, art, prayer, poetry. For music combined with the amazing figurative artwork of Peter Howson, take a look at Transfiguration. 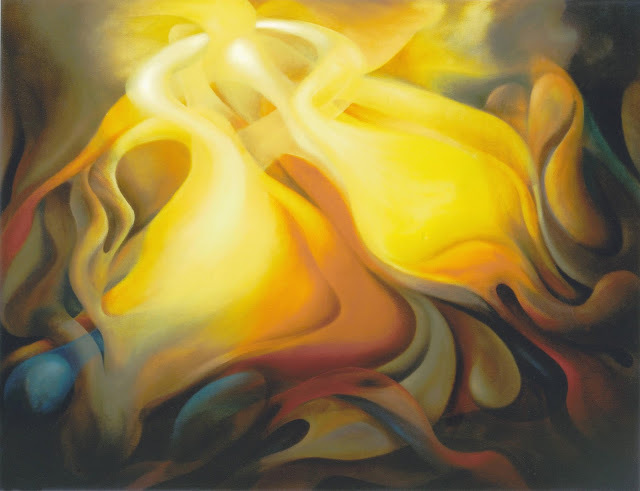 For art, take another look at the image at the head of this post of the oil painting entitled 'Transfiguration of Jesus' by London-based Turkish artist Armando Alemdar Ara. Or go to it on Wikipedia here. I also love the Transfiguration Window in Durham Cathedral. For poetry, you may like the poetic reflection by Ann Fontaine entitled 'Transfiguration' on her blog 'What the Tide Brings In'.